Location: On the south-east side of the Varteg to Llanhilleth mountain road at The British. The engine house backs onto the road and faces the yard behind. Former colliery engine house, built c1900 for Lower Navigation Colliery. It contained a fan engine driving a waddle fan on the south west end of the building, a winding engine for a shaft to the south east, and compressors and generators. It is an unusually early example of a combined engine house in which two or more functions were performed; an economical design embraced more fully in the following decades, especially by the Powell Duffryn Company. Waddle fans were among the most important mechanical fans in use in the late nineteenth century, and the only major fan to be invented and made in Wales. Two storeys high, of red brick with pilasters, corbelled string courses, and a deeply corbelled eaves cornice. The building has a hipped slate roof topped by red ridge tiles and finials. There are four tall, segmental arched windows to each of the long elevations on the first floor, all with small paned metal windows 7 x 4, and two windows to the north east elevation together with a central doorway reached by an external staircase. The windows have corbelled brick heads and surrounds. The ground floor has a series of smaller arched windows and circular holes for supply pipes and the fan drive. A further opening, probably for winding cables, has been blocked on the south east side . The brick supports for a waddle fan survive adjoining the south west end of the building, linked to the engine house interior by a doorway and drive-shaft hole (now blocked). The interior is open to the roof at first floor level. All the machinery has been removed, and the hall is divided into office and workshop space. The ground floor is divided by massive brick walls and concrete columns which support the floor above and provided a base for the winding engine. The interior was not inspected at resurvey (January 1997). 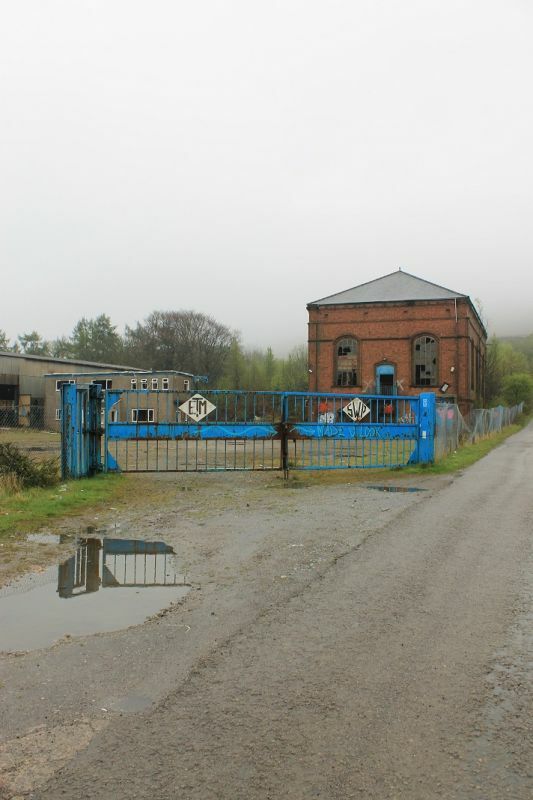 Listed as an early example of a colliery common engine hall, with a possibly unique surviving waddle fan base. On the site of the British Ironworks about 100m north east of the former British Ironworks office and foundry quadrangle. About 500m to the west of The British on the south side of the mountain road to Abertillery.